Louise Hawes also writes in other genres. You can read about her other works at her website. Read Kelly’s interview with Louise Hawes. CLICK HERE FOR MORE BOOKS BY LOUISE HAWES. Kelly recently interviewed Louise Hawes after reading and enjoying her book Black Pearls: A Faerie Strand (2008). You can read Kelly's review here and learn more about Louise Hawes and her works in other genres at her website. Kelly: Did you have a favorite fairy tale as a child? Do you have a favorite now? If so, what made/makes that particular story resonate with you? Once upon a time, there was a woman who was so caught up in a book that she did nothing all day but read it, from cover to cover. 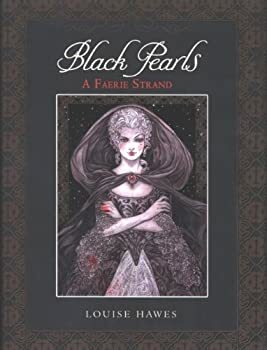 Black Pearls: A Faerie Strand is a gem. 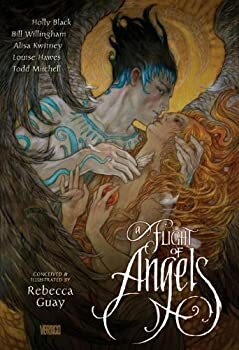 Louise Hawes' dark, sensual fairy tale retellings and Rebecca Guay's evocative illustrations work perfectly together to form one of the best books of retold tales that I've ever read. I checked this out from the library, but I've resolved that I simply must have a copy of my own to treasure. An angel has fallen. Led by their insatiable curiosity, the hosts of fae have followed the descent of the white-winged creature and now gather around his still-breathing body to decide what to do with him. They decide to hold a trial, and present evidence in the form of stories about the deeds of angels to decide whether or not to let him live.